This is a hand crank "Little Modiste" sewing machine, complete with the table clamp. It is in great condition, the little wooden knob on the wheel looks hardly used. The box contains pins - hair and two colors of straight pins. Each pin was individually inserted into the paper roll which was then rolled with the black pins in the center. The hair pins are in four sizes, the smallest size is empty. 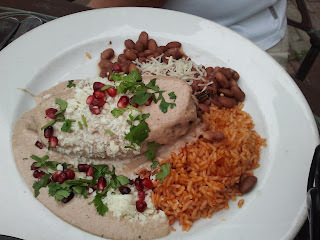 We also went to Taos, New Mexico. Definitely a place to get back to for a longer trip. 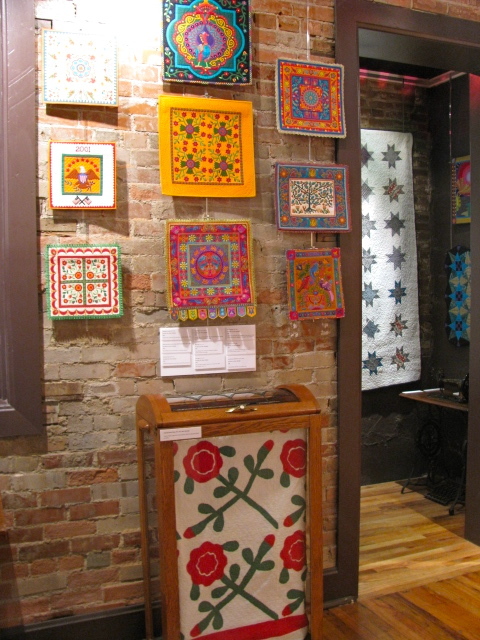 There are beautiful art galleries filled with woven rugs, pottery, jewelry and paintings. Not too many quilts. One of the galleries with Henri Matisse works also had an Amish wool doll quilt. Thinking back, I wish I had asked to see it closer...next time. It is a dish served in the area for celebrations. Roasted poblano pepper stuffed with beef, apple, raisins, onion, tomato and seasoning. The sauce is brandy cream sauce with pecans, garnished with pomegranate seeds and cilantro. Since we were celebrating of course we had to order it! June was a great month shared with friends near and far - hope your is too. I hope your week is filled with big blue skies. Part of my June travels included a stop at the Rocky Mountain Quilt Museum. Sue Nickels & Pat Holly"
It was a beautiful exhibit of old and new quilts. 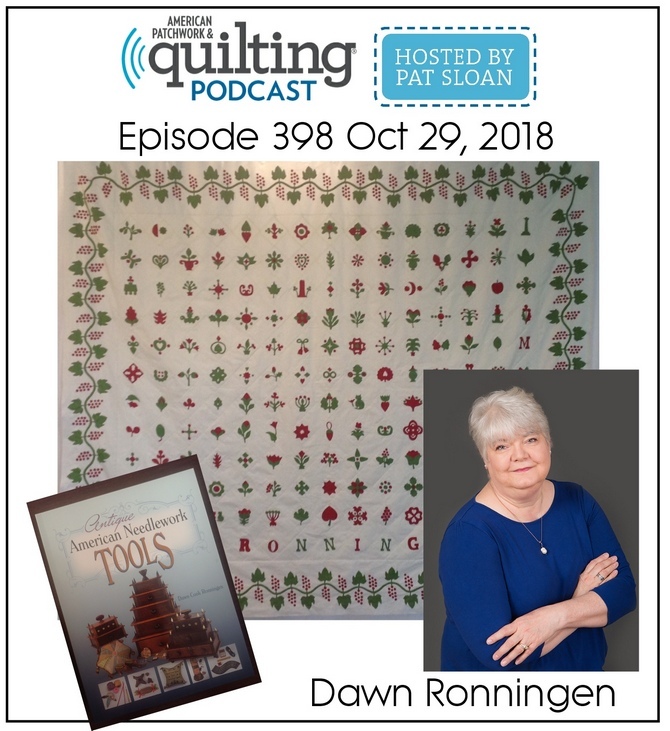 The new quilts by Sue and Pat, the old quilts are pieces from collection of vintage and antique quilts. 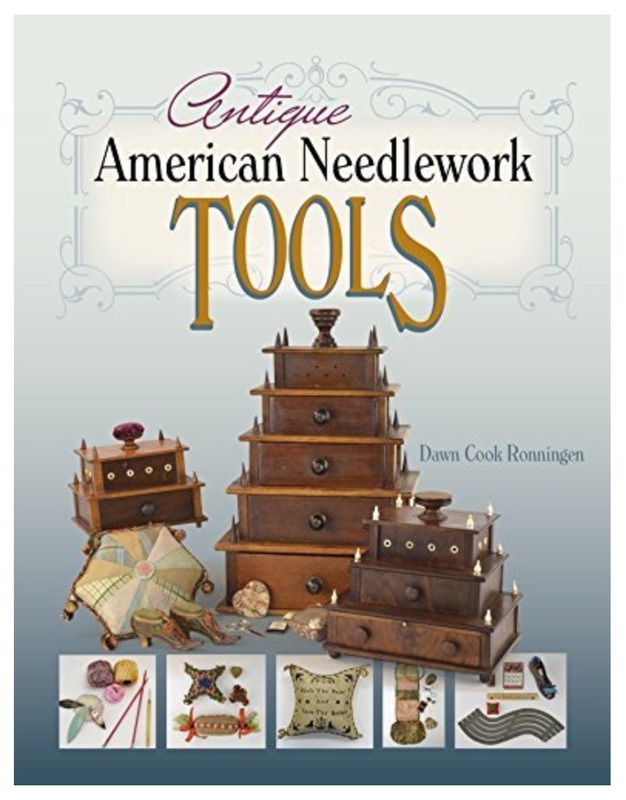 The museum does a wonderful job including other items of interest, in this example - antique sewing machines. 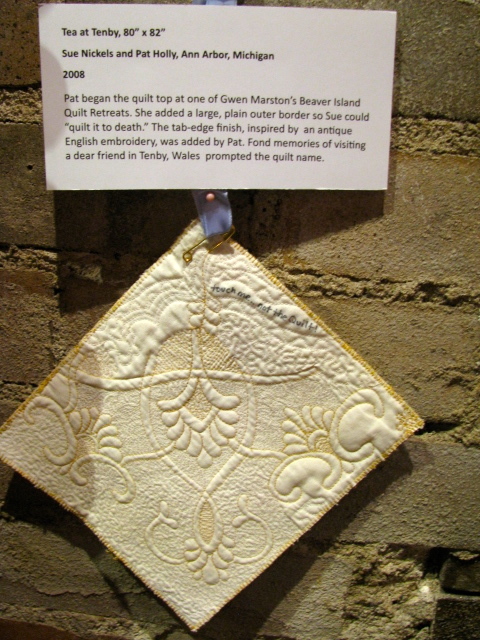 The quilts were fascinating to see up close. They are machine appliqued in a decorative stitch. The machine quilting is a diagonal grid 1"apart, over the red fabric and the border. 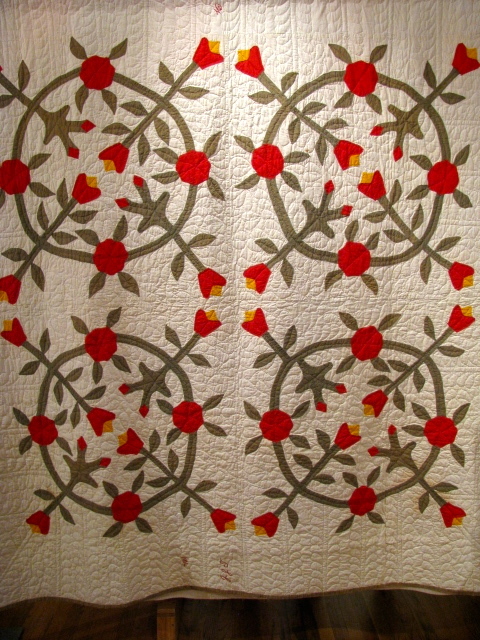 Two rows of free motion echo quilting are inside the plume and around the red center star. The borders are quilt as you go. 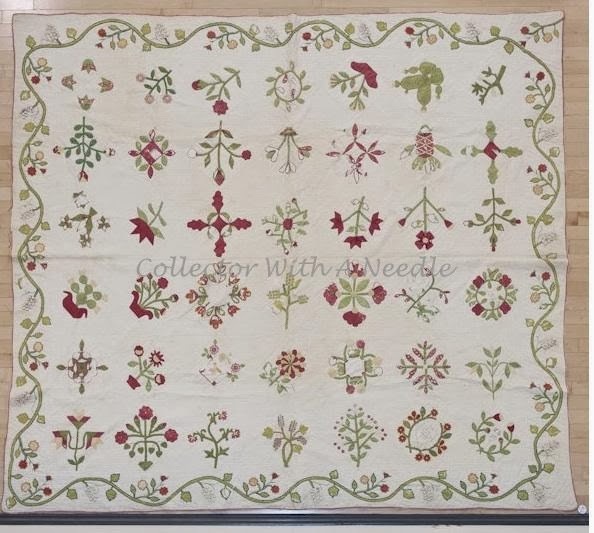 The pattern company, Mountain Mist, suggested making a second quilt with the opposite color arrangement. 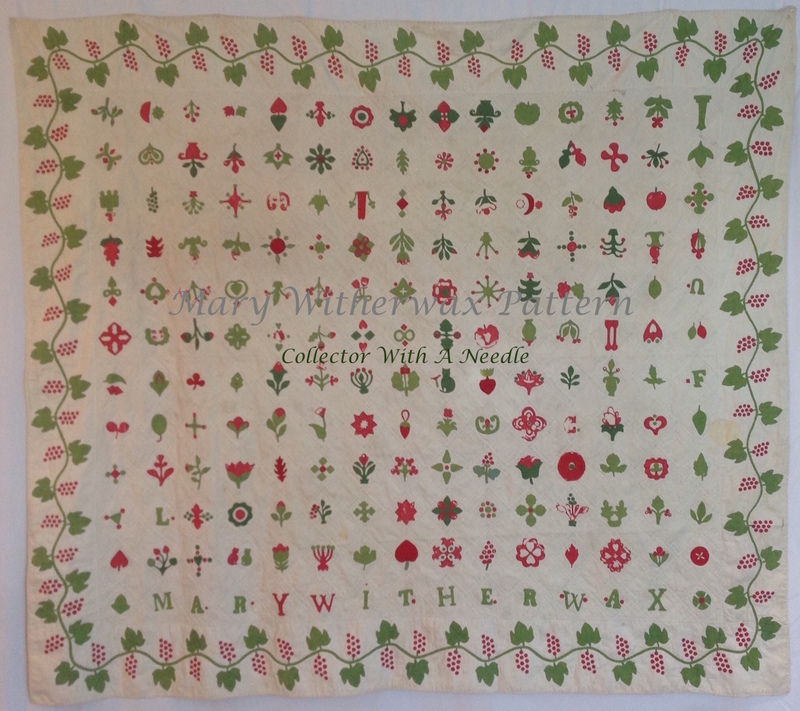 This was one of several red/green applique examples. All applique is done with tiny machine stitches using white thread. 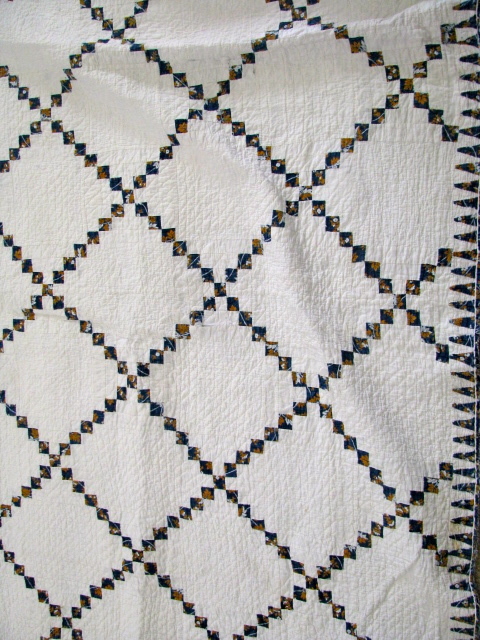 Hand Quilted, pencil lines are still visible in some areas. This is a detail of the machine applique flower and stem. 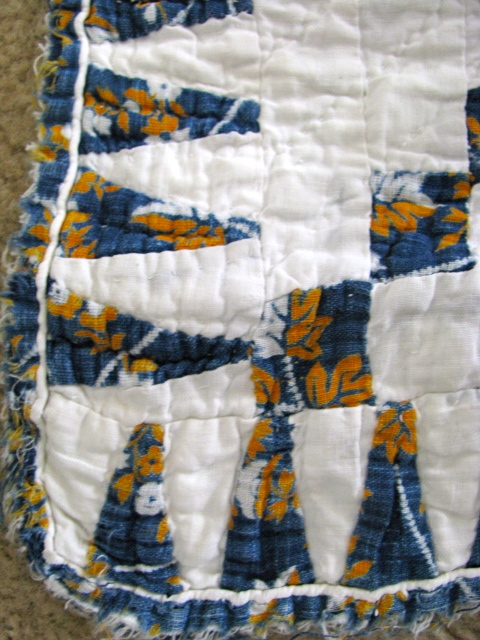 You can also see some of the hand quilted feathers surrounding the machine work. One of the walls included several of Nickels/Holly contemporary small quilts. This picture shows the quantity of pieces, and gives you an idea of how small they are compared to the size of the brick. 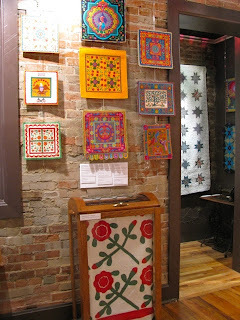 Oh, how I would enjoy an exposed brick wall to display quilts on. it. If you have ever white gloved you know how badly people want to touch the quilts! This is such a good idea to have available. Fabulously soft with a lovely 'drape'. The tag doesn't say but I think it was silk with a silk batting. 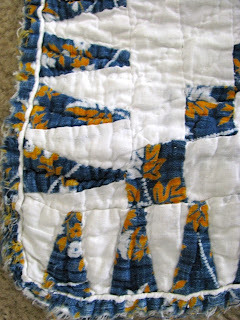 This example has hand applique, reverse applique and machine quilting. I took too many pictures to post here, so if there is something you want to see more of just let me know. There are also many more pictures on the RMQM website. The exhibit runs through July 27, 2013. When you are in the Denver area it's just a short janut to Golden and the RMQM. We also shopped the repro fabrics in the gift shop. 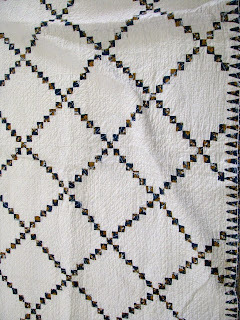 As promised here are some of the June antique quilt purchases. This is one of several my friend bought. She gave me permission to share this one. Sorry for the wrinkles, but every time a quilt comes out my dog thinks it is her job to lay on it and help. Since it isn't my quilt I was in a hurry...I think the quilt is about 80 something by seventy. All hand pieced and quilted. The blocks are probably older, and were set and finished at a later time. Of course you need to see a closeup of the fabrics. I think the stars are about 7" finished. Some prints repeated in the pieced blocks. A few stars are three prints, some are four or more. Love the blue - kind of a lily of the valley print. Dots, plaids and checks - all belong together. This is a lovely combination - Madder stripe, double pink with the red check alternate block. Just looking at this again makes me want to stitch a star or two. How about you? So what did I buy? Not as much as some people who will remain nameless... What happens shopping stays with the shoppers!! The binding is a little worn, but how about the print? It is all hand pieced and hand quilted. Even the binding is all hand applied. In a place where the binding is loose I can see the basting stitches holding the piping in place. The pattern is a single chain. 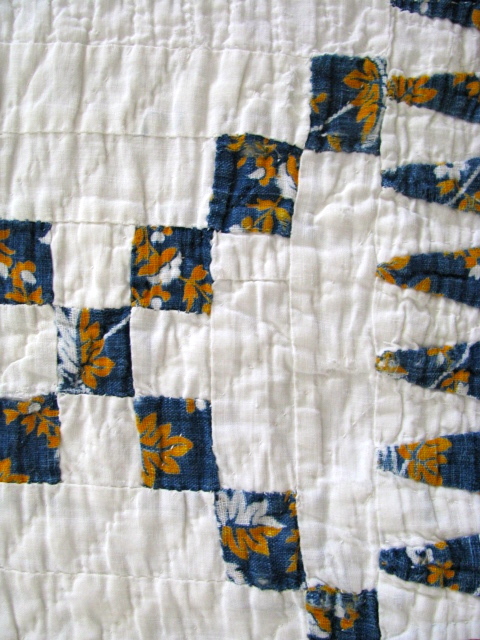 The indigo squares are 1"
The border triangles are 1.5" long. It is a very large quilt at 116" x 120"
Then sticking to what appeared to be a blue theme that day - I also picked up this sweet nine patch. It too appears to be hand pieced and quilted. The binding is hand applied and finished. It is perhaps the softest quilt I have ever seen. The ivory spots are not stains. It is fabric of a more muslin color that the white sashing. What a great theme - All blue stripes. 6" Nine patches, 2"x6" sashing strips with 2" sashing corners. and a scrappy 2" stripe border. A fun variety of blues, with a few non-stripes thrown into the stripe theme for good measure. Add some texture and a sprinkle of red. This square has it all: stripes, texture, red, multiple blues...all packed in a 2" square. Note the texture in the whites as well. Hand quilting on the diagonal. Extra suitcases were purchased and filled! Which of the three quilts speak to you? At one point this spring I thought I might finish the hand quilting on Calico Paradise - as luck would have it - life had other GREAT plans for me. June flew by in the BEST way!! Here is my Calico Paradise in the frame - with most of the outline quilting done. That leaves me the option to roll back and do the filler quilting in the frame - or - move to a hoop. 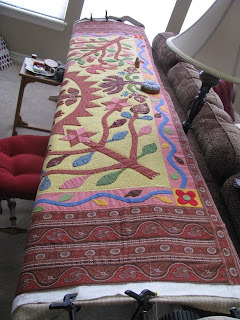 Nancy at Tattered Garden Quilting just posted about her start on Calico Paradise HERE. I enjoyed seeing her wonderful stack of fabrics for the project. She also shares her methods. My applique choice is back basting and needle turn. I love it as we can all use our own comfortable methods and enjoy our projects!! ENJOY being the key word. Stop by and cheer Nancy on. As I said June flew by filled with the best times with the best of friends! 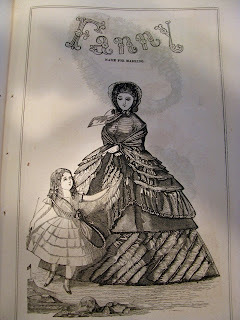 So much so I need a separate post or two to share all the fabric and antique shopping as well as travels near and far. I hope I can remember all the details - I can tell you new extra large suitcases had to be purchased! I hope you are enjoying a bit of paradise this week. I've been busy and doing some travel but wanted to pop in and say hello. For those of you celebrating July 4, have a fabulous Independence Day holiday. 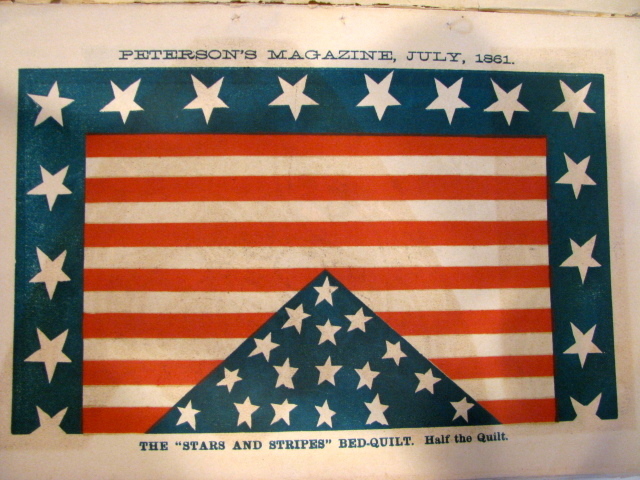 This is a quilt pattern page (10" x 6.5") from Peterson's Magazine, July 1861. "Stars and Stripes" illustrates half the quilt in color. A maker only had this to go by - the size, yardage etc. were open for interpretation. This is the cover of the issue. All of the pages are in tact in my copy. You can read the entire issue using the link below. 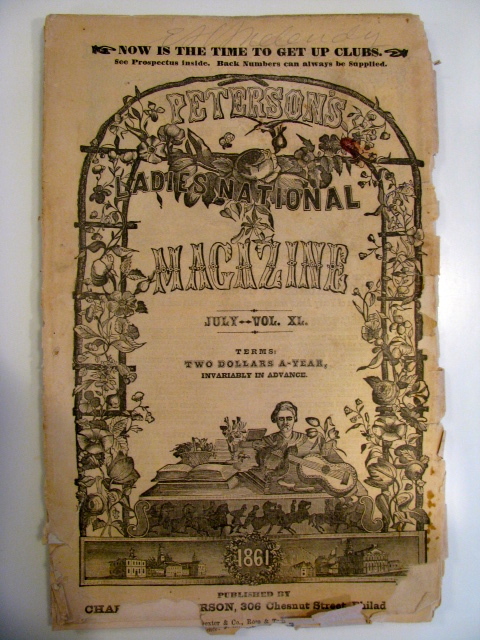 In 1861 a one year subscription cost $2. This is one of the fashion plates. 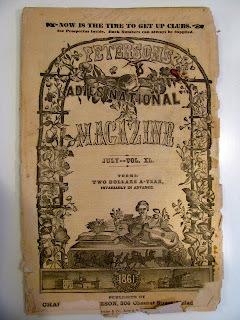 The latest and greatest in the summer of 1861. "Fanny" is a template for marking. The dark image from the reverse page is the image of fashionable head gear. Earlier in 1861 (January/February) the south seceded and created the Confederate Constitution. Have a great July 4th holiday - be safe and have fun! !